Work. For most people, it's a necessity. For some, it's a passion. And for others, it's a four-letter word to be avoided as much as possible. 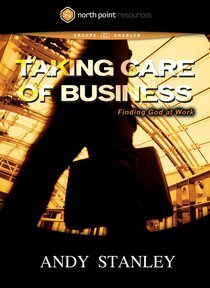 In this DVD and accompanying study guide from North Point Resources, readers will come to grasp the one perspective on work that really matters: God's. He ordained it and He laid out specific guidelines enabling workers to achieve maximum success and fulfillment. In each session, Andy Stanley offers insights on common, specific problem areas people have, from dealing with coworkers and superiors, to boldly living the Christian faith, to balancing work and family. About "Taking Care of Business (North Point Resources Series)"
Discover seven simple ways to revitalize your ministry through the parable of Ray Martin, the founding pastor of Meadowland Community Church. Busyness, pressures, and programs have blurred his original vision. But a night at a most remarkable baseball game changes everything! Pastors and church leaders will welcome this refreshing approach to ministry. 240 pages. When you were young, you were told, "You are special!" and were encouraged to become anything you wanted. The future held unlimited options. But then life happened. And now you look around feeling, thinking, looking, and acting basically the same as the next guy. You can't help but feel trapped and hemmed in. Unfortunately, many try to break out of the suffocating sameness by making the same bad decisions over and over again. This Breakaway DVD and study guide are designed to renovate your thinking by illustrating four core beliefs that dictate the decisions shaping the outcome of your life. This study will help you break out of the crowd and away from bad patterns for good! When you were young, you were told, "You are special!" and were encouraged to become anything you wanted. The future held unlimited options. But then life happened. And now you look around feeling, thinking, looking, and acting basically the same as the next guy. You can't help but feel trapped and hemmed in. Unfortunately, many try to break out of the suffocating sameness by making the same bad decisions over and over again. The Breakaway DVD and study guide are designed to renovate your thinking by illustrating four core beliefs that dictate the decisions shaping the outcome of your life. This study will help you break out of the crowd and away from bad patterns for good! Whether you speak from the pulpit, podium, or the front of a classroom, you don't need much more than blank stares and faraway looks to tell you you're not connecting. Take heart before your audience takes leave! You can convey your message in the powerful, life-changing way it deserves to be told. An insightful, entertaining parable that's an excellent guide for any speaker, Communicating for a Change takes a simple approach to delivering effectively. Join Pastor Stanley as he discovers that the secrets to successful speaking are parallel to the lessons a trucker learns on the road. By knowing your destination before you leave (identifying the one basic premise of your message), using your blinkers (making transitions obvious), and implementing five other practical points, you'll drive your message home every time!